Having just read through these 'evangelistic' testimonies of born-again atheists on Richard Dawkins' site, I am struck by the similarity of style in most, if not all, of the contributions. Does this strike anyone else? I am sure that Professor Dawkins would not do anything so dishonest as have one person write all these entries! Fr Tim the Continuous Hermenaut has blogged about eyeglasses (also known as monocles). It reminded me of a visit I made with a friend to a very remarkable priest in Normandy called Fr Quentin (or perhaps Quintin) Montgomery-Wright. A convert clergyman, who had served as an Anglican at St Augustine's Kilburn (I think), his home being Mevagissey in Cornwall, on his conversion he had joined the diocese of Evreux in Normandy, and had been made, in the 1950s the Curé of the village of Le Chamblac and a couple of surrounding clochers. Initially, he had been very enthused by the Liturgical Movement. Well before it was legal, he had turned his altar around and (like a few daring others) was celebrating Mass in French. He told me that his fellow priests in the deanery had accused him of being 'scarcely Catholic'. About 1967, he had found the general disintegration of things uncongenial, and, being told that nobody actually obliged him to celebrate in French, had returned to Latin, facing East on his forward-altar, and never again changed his mind. 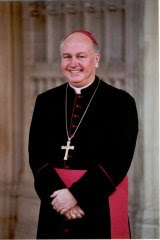 He never entirely allied himself with Archbishop Lefevbre, though he was willing enough to have confirmations administered by the Archbishop (and also by his consecratees after the events of 1988). The famous heterodox bishop of Evreux, Jacques Gaillot, had been kind to Montgomery-Wright (no doubt thinking that if his own strange views ought to be tolerated, then so should those of others) and had not disturbed him in his parish, but a change in diocesan boundaries had landed him in another diocese where things were not so peaceable. Nonetheless he was left (more or less) alone until he tragically died in a car crash (he was a truly frightening driver, as I well remember). (A ring at the door interrupted my flow: I have just had a most interesting conversation with a woman who lived in Holland during and after the Second World War). Finally, while I was with Fr M-W, the thought struck me that here in Le Chamblac was a priest who had celebrated the traditional rites pretty continuously from the 1950s until the 1990s. Here, if anywhere, was the 'control' for the liturgical and pastoral experiment of those years. What might the Church have been like had the changes not happened? So I asked him about religious practice in his parish. Had as many ceased to come to Mass during the last thirty or forty years as had done so elsewhere? His answer was that two families had ceased to attend in Le Chamblac, but that they went instead to the French Mass in the next parish. Other than that, all families practised as they had before. Maybe he was simply a loving and good pastor (I thought that, in any event). But I think that the figures speak for themselves. [Rather shamefacedly] May I credit Fr Anthony Chadwick as being the source of this photo. I had assumed that, being on the internet, it was a generally available pic, and have found that this is not so from his charitable observation on the Anglo Catholic blog (ref. left). I thank him warmly for his permission to post. Some more wonderful photographs here. 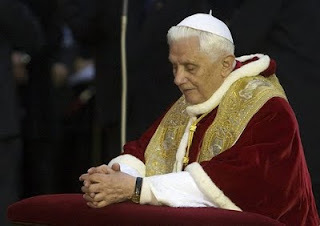 Over on Andrew Cusack's blog (link to the left) I think I have seen my favourite picture (to date) of Pope Benedict. 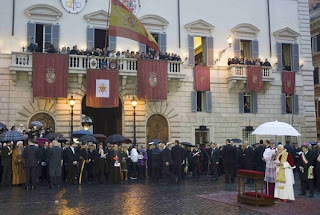 The occasion was the crowning of the statue of the Immaculata in the Piazza di Spagna. In this second picture, from the same place, you can see, on the left, a gentleman in very Islamic costume. Puzzling? No doubt he was a diplomat from some Islamic state, but it is a reminder that the Moslems also believe (I am told) in our Lady's Immaculate Conception. For some strange reason, Orwell's Picnic and Australian Catholic have banned me from access to their blogs, despite me having advertised them for some time. I'm sorry that many of you who kindly contributed comments didn't have them approved and posted until a couple of minutes ago; for some reason the normal information didn't arrive by email as it usually does, and I wasn't aware the comments were there. 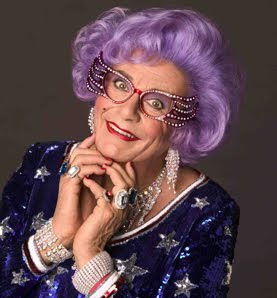 Are the grande dame of Catholic journalism, Mary Kenny, and the other sort of dame, Edna Everage, by any chance related? I think we should be told. P.S. No offence intended. I love Mary Kenny's writing! The LMS is running another course at Ushaw, near Durham, to help priests learn to celebrate the extraordinary form. They have asked me to publicize this, but there seems little point in repeating what is already on other sites, so if you would like to find out more, you might consult Fr Ray's blog here. This week's Tablet carries two letters, one of which I richly enjoyed, the other I didn't. …I have often wondered why otherwise intelligent people spend so much time and energy writing about an entity that they are sure does not exist. Richard Dawkins, for instance, regales us with theologically spurious treatises on the non-existence of God. He is a brilliant scientist and I am an admirer of his scientific books, but why doesn't he stick to what he knows or believes to be true? Why does he waste his valuable time on things he considers non-existent or untrue? Can we expect a Dawkins book on the tooth fairy some time soon? As they say on the net, LOL. While admiring the erudite and theological expertise of Rowan Williams' article in last week's Tablet, ("A gender divide - or not?" 28 November), I still believe that the male and masculine influence does women an insulting, patronising disservice. The Church [capitalization original] I belong to is in an inclusive "Catholic" tradition with a rich eucharistic pattern of worship, based on the Christian year and fed by a wonderful choral tradition. The parish has a curate who happens to be a woman, and whose sense of priestly vocation is affirmed, loved and encouraged by most of the congregation. Soon another female curate will join the clergy team, and she will experience the same love and acceptance. There are no bibilical or theological reasons for denying women in today's Church the right to be called by God to priestly ordination. Those who seek to perpetuate the view that because women happen to be women they cannot be called by God to this ministry are deluded not by theology or ecclesiology but by stubborn prejudice, fear, and other psychological issues. Let us be clear; this is an Anglican writing in a Catholic journal about the Catholic Church. I do not deny that there may be some—a few—Catholics who would applaud his words, but for sheer unecumenical jingoistic cheek this takes some beating! Apparently, every Christian for one thousand nine hundred and fifty years has been deluded by stubborn prejudice or fear, or is a nutcase. Now, it appears, magically as from a deus ex machina, the truth has descended on this privileged group, and it is WE who are the nuts, our views held by the majority of Christendom still and the same throughout all our history, we who have no theology, no ecclesiology, but are simply screwballs! Here we are, back in the sixteenth century; a new innovation that appears to override all other considerations in the Gospel, a 'truth' that overrides all other doctrines and marginalizes them. Women can be priests, and those who say that they cannot are stupid, or don't know any theology, or are mad. I'd write more, but I must go to Benediction. At the seminary this morning, in between my two hour-long lectures (to the same class, poor chaps), a notice was posted announcing the resignation of the Most Reverend Kevin McDonald, the Archbishop of Southwark, by reason of his continuing ill health. We wish him a happy retirement, and greatly improved health.